The James Madison University ISTE*T Certification Program is a 12-month portfolio assessment program that engages teachers in an intensive, deeply reflective process to determine if their instructional technology practices meet the standards set forth by the International Society for Technology in Education. This opportunity is designed for self-directed learners, confident in their use of technology and eager to measure their use of technology in the classroom against an international standard. Originally developed in 2003, the current ISTE*T program uses synchronous and asynchronous tools and offers James Madison University graduate credit upon successful completion. 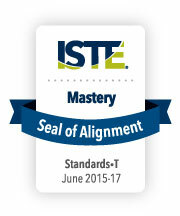 The James Madison University ISTE*T Certification Program successfully underwent the International Society for Technology in Education (ISTE) Seal of Alignment review for Mastery. Reviewers determined that this online program measures mastery in the ISTE Standards for Teachers through a portfolio-based assessment process. With a mentor-based approach for supporting the preparation and submission of portfolios and a detailed set of rubrics for evaluating portfolios for alignment with the ISTE Standards for Teachers, the James Madison University ISTE*T Certification Program is designed to certify that participating educators have demonstrated the ability to meet the ISTE Standards for Teachers. This program incorporates ISTE Standards-aligned learning objectives, specified implementation plans and embedded tools for measuring mastery in the ISTE Standards for Teachers.